We also offer a 1K race for kids under 14. Participants receive ribbons and the top finishers win medals. Watermelon and other refreshments are provided. Register on race day only for the kid's race. 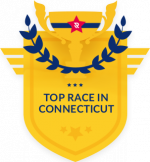 Registration for both races on the day of the race begins at 4:00 PM at the corner of North Main St and the Town Hall Access road on the Higgins Green. Hope to see you there!! Please note - the Angelo Lamanga center will not be available for showers this year. Click here to view the race route (subject to change).